Cebu Pacific is preparing to launch services to Hawaii by the end of 2015 and is also interested in launching Melbourne if it is able to secure additional traffic rights for Australia. Honolulu and Melbourne would be Cebu’s sixth and seventh long-haul destination, joining four in the Middle East and Sydney. Cebu Pacific is also planning to start using its A330-300 widebody fleet to operate some of its flights to Hong Kong, Taipei and Tokyo. It currently uses the A330 on one of its daily Singapore flights and plans to add a second widebody frequency on Manila-Singapore, which is already its largest international route. The new A330 flights will increase the utilisation rate of its widebody fleet, which is now low for LCC standards, and drive a 30% surge in total ASKs for 2015. The capacity growth is being achieved despite Cebu Pacific only expanding its fleet by three aircraft in 2015, including a single additional A330 as the carrier has shelved plans for adding two more A330s for a total of eight. This is the second of a two part series of analysis reports on Cebu Pacific’s long-haul operation. The first report analysed the overall performance of Cebu’s long-haul operation and focused mainly on its operation in the Middle East, which accounts for most of Cebu’s long-haul capacity. This part will look more closely at Cebu’s plans for Hawaii and potential expansion in Australia as well as plans for expanding the use of its A330 fleet on short-haul routes. Cebu Pacific has been keen to launch services to Honolulu since the US FAA upgraded the Philippines to a category 1 safety rating in Apr-2014. The US prohibits the launch of any new services from airlines registered in countries with category 2 safety ratings. Cebu Pacific initially had to wait to secure Extended Diversion Time Operations (EDTO) certification of 120min, which is needed to use the most direct and efficient routing for Manila-Honolulu. Cebu Pacific secured the certification in early Apr-2015 and is now waiting for final approval from the US TSA, which has to complete an assessment of Manila Terminal 3 before Cebu Pacific can serve the US. Cebu Pacific remains optimistic it will be able to launch services to Honolulu by the end of 2015. It is also aiming to launch service from Manila to the US territory of Guam but this shorter route will be operated using Cebu’s A320 fleet. Hawaii’s Filipino community will be the main target market for the planned Honolulu service. Manila-Honolulu is only currently served non-stop by Philippine Airlines (PAL) with five times weekly A330-300 frequencies. Hawaiian Airlines pulled out of the Manila market in 2013, leaving a potential opening for a second carrier. But the upgrade to Category 1 has enabled PAL to expand in the Hawaii market ahead of Cebu Pacific. 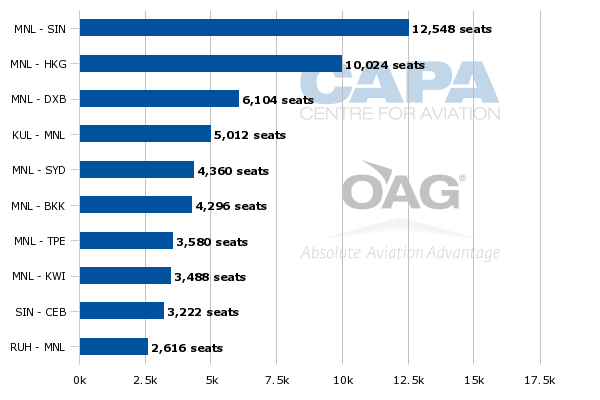 PAL has more than doubled seat capacity to Honolulu over the last year, according to CAPA and OAG data. 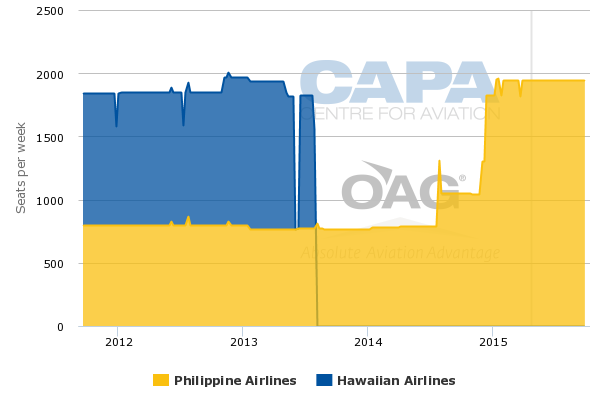 Total capacity in the Philippines-Hawaii market is now back to the early 2013 levels (prior to Hawaiian’s withdrawal). Cebu Pacific is banking it can stimulate demand and grow the market by breaking PAL’s monopoly and providing a new low-cost option. Honolulu is a key route as it will allow Cebu Pacific to diversify its long-haul network, which now relies heavily on the Middle East. Cebu’s only current long-haul route outside the Middle East is Sydney, which it launched in Sep-2015. Cebu Pacific launched Manila-Sydney with an initial four weekly frequencies and added a fifth weekly frequency in Dec-2015. The increase to five weekly flights, which fully utilises its current allocation in the Philippines-Australia bilateral, was planned when it first announced the Sydney route and began sales in Australia in Jun-2014. Since launching its long-haul unit in 2013 Cebu Pacific has pushed for an expanded air services agreement between the Philippines and Australia which would provide sufficient traffic rights to support a daily service to Sydney as well as Melbourne. Cebu Pacific is confident a new round of talks between the Philippines and Australia scheduled for 28-Apr-2015 will result in a significant increase in the current cap. As CAPA has previously outlined, the capacity limit only applies to Sydney, Melbourne, Brisbane and Perth. All other Australian airports, including Melbourne alternative airport Avalon, can be served by Filipino carriers without counting towards the cap. But Cebu Pacific is only interested – at least at this point – in serving Melbourne Airport, which also has been lobbying Australian authorities to forge a new air services agreement with the Philippines. The usually liberal Australian authorities have been in turn pushing Philippines officials to allow Australia beyond rights including third-country codeshares, for use by Australian airlines. Cebu Pacific is currently allocated 2,200 of the 6,000 available weekly seats for Filipino carriers while Philippine Airlines (PAL) is allocated the remaining 3,800. Based on the current five weekly flights schedule Cebu Pacific currently has 2,180 weekly seats to Australia as its A330-300s are in 436-seat single class configuration. PAL also currently serves Sydney with five weekly flights using A330-300s but in 368-seat three-class configuration with economy, premium economy and business. PAL and Cebu Pacific compete in the Manila-Sydney market against Qantas, which operates four weekly flights on the route using A330-300s in 297-seat two-class configuration. PAL is currently the only carrier operating non-stop flights from Manila to Melbourne, which it serves three times per week with A330-300s. PAL also serves Darwin with three weekly A320 flights that continue on to Brisbane. PAL launched Darwin in Jun-2013 with seven weekly frequencies – including four that continued to Perth and three to Brisbane. But PAL quickly dropped the Manila-Darwin-Perth service in Sep-2013. PAL currently has about 3,400 weekly one-way seats to Australia compared to the 2,180 for Cebu Pacific and 1,188 for Qantas. While PAL is currently not fully utilising its allotment for Australia it typically adds capacity during peak periods. For example PAL operated daily flights to Sydney in late 2014 and early 2015. PAL also has used a wide variety of aircraft types in recent years on the Melbourne and Sydney routes, including A340s and 777-300ERs. Cebu Pacific executives said during the carrier’s 4Q2014 results presentation that it is keen to secure capacity entitlements to support 14 weekly frequencies to Australia. This would enable Cebu Pacific to operate daily flights to both Sydney and Melbourne, resulting in 6,104 weekly one-way seats in the Philippines-Australia market. Assuming the current level of capacity from PAL and Qantas, total one-way weekly seat capacity in the Philippines-Australia market would increase to about 10,700, which represents nearly a 60% increase over current levels and about a doubling of capacity compared to Aug-2014 (prior to Cebu’s initial entrance). Cebu Pacific would capture a 57% share of capacity under such a scenario – but that assumes no competitive response by PAL, which could increase capacity to Melbourne as it did when Cebu Pacific started to Sydney. Cebu Pacific is optimistic such a large surge in capacity can be supported as its low fares stimulate demand and grow the total size of the pie. Cebu Pacific executives point to a 42% increase in total Manila-Sydney traffic from Sep-2014 through Dec-2014, the first four months it was competing in the market. The growth in the Sydney market “convinces us that this is a market worth investing over time,” Cebu Pacific CEO Advisor Garry Kingshott said during the carrier’s 4Q2014 results presentation in late Mar-2014. Under the previous PAL-Qantas duopoly the market would have never grown at such a fast rate but the entrance of an LCC competitor has succeeded in driving down fares and stimulating new demand. Australian airports experienced similar growth in other Southeast Asian markets as other long-haul LCCs entered, including Scoot in the Sydney-Singapore market and AirAsia X in the Melbourne-Kuala Lumpur and Melbourne-Sydney markets. Cebu Pacific sees an even bigger potential opportunity to stimulate demand in Melbourne because Manila-Melbourne is currently only served by one carrier rather than two. Both Sydney and Melbourne have large Filipino communities, making both markets attractive to Cebu’s long-haul division. Cebu Pacific’s long-haul business plan mainly targets ethnic and expatriate or labour traffic although in the Australia market it also expects a growing segment of inbound leisure traffic as the Philippines emerges as a popular alternative tourist destination for Australians. Cebu Pacific’s aspirations for two daily flights to Australia, however, could prove overly ambitious. The Philippines-Australia market is extremely seasonal and at least for the short to medium term is unlikely to support such a large amount of capacity (over 10,000 weekly one-way seats) except during the peak periods. Most Filipino expatriates as well as students return home during holiday periods due to their work or study schedules. It will be hard to stimulate sufficient demand from Australia’s Filipino community to fill up a 436-seat aircraft daily from Sydney or Melbourne on a year-round basis. Cebu Pacific should be able attract some Australian outbound holiday traffic as well as connection traffic beyond Manila to destinations such as Hong Kong, South Korea and Japan – by offering significantly cheaper fares than the non-stop providers. But demand from such sectors also varies significantly depending on the time of the year. And competition in the one-stop Australia-North Asia market is extremely intense. Even with the current Australia schedule of five weekly flights Cebu Pacific has been struggling during off peak and shoulder months. For example after a strong January Cebu Pacific saw a decline in its Manila-Sydney load factor in February, which is typically a relatively weak month for the Australian market as it falls between the southern summer holiday period and Easter. Cebu Pacific seems concerned it could see similar drops during other off-peak periods as it has cut one weekly frequency from its Manila-Sydney schedule for Jun-2015, Aug-2015 and Sep-2015. Cebu Pacific will only operate four weekly flights during these three months but plans to operate the normal five weekly flights in Jul-2015 as well as in Oct-2015, Nov-2015 and Dec-2015, according to its online booking engine. The temporary reductions to Sydney are sensible but are an indication of the challenges in maintaining a frequent service on a year-round basis. Cebu Pacific obviously is keen to secure enough traffic rights for daily to Sydney and Melbourne, as this would give it the flexibility to gradually expand in the Australia market if market conditions warrant. But Cebu Pacific could end up with a schedule that only offers daily – or close to daily – services in both Australian markets during the peak periods. Quickly expanding to 14 weekly flights to Australia would also not be in line with Cebu’s generally conservative approach to expansion. Cebu Pacific has slowly expanded its long-haul operation since taking its first A330 two years ago and instead has been using a portion of its A330 fleet to operate short-haul routes. The use of the A330 on routes such as Cebu, Davao, Seoul and Singapore have been profitable and significantly reduce the overall risk that comes with launching a long-haul widebody operation. Cebu Pacific is keen to add capacity to both Australia and the UAE, where it is also seeking more traffic rights which would support the potential launch of services to Sharjah. But such expansion would require that the A330 be removed from some profitable short-haul routes. Cebu Pacific currently uses the A330 to operate three short-haul routes including 17 weekly flights on Manila-Davao, four weekly flights on Manila-Cebu and one daily flight on Manila-Singapore (based on OAG schedule data for week commencing 20-Apr-2015). Mr Kingshott said Cebu Pacific has secured approval to up-gauge a second daily Manila-Singapore frequency to the A330 and is also planning to start using the type on some flights to Hong Kong and Taipei. Cebu Pacific currently operates 25 weekly flights on Manila-Singapore, 28 weekly flights on Manila-Hong Kong and 10 weekly flights on Manila-Taipei. Manila-Singapore is Cebu’s largest international route, slightly ahead of Manila-Hong Kong, as the A330 is already used on seven of the Singapore frequencies. Manila-Taipei (TPE) and all four of Cebu’s current long-haul routes – Manila to Dubai (DXB), Sydney (SYD), Kuwait (KWI) and Riyadh (RUH) – are also among Cebu’s 10 largest international routes. The use of the A330 on Hong Kong and Taipei is made possible by new air services agreements that significantly increase the total capacity available to Filipino carriers in both markets. Deploying A330s on some Hong Kong flights is particularly logical given the slot constraints at Hong Kong. Cebu Pacific was previously unable to up-gauge any of its Hong Kong flights to A330s without sacrificing an existing slot because the Philippines-Hong Kong bilateral has seat capacity (rather than frequency) limits. Cebu Pacific has previously only operated a very small number of ad hoc A330 flights to Hong Kong during peak periods. Cebu Pacific also has been keen to add capacity to Taipei for some time as demand in the Philippines-Taiwan market has been growing rapidly. Following the new bilateral agreement between the Philippines and Taiwan, which was forged in Mar-2015, Cebu Pacific is now free to add frequencies to Taipei. But the market is big enough to support A330s during peak periods. Cebu Pacific is also planning to again use the A330 on some flights to Tokyo Narita, which it currently serves with one daily flight. Cebu Pacific operated the A330 on some of its Tokyo flights in 2014 during the peak northern summer months. In addition Cebu Pacific previously operated the A330 on some flights between Manila and Seoul, which it currently serves with one daily A320 flight. Cebu Pacific will continue to take a flexible approach to using the A330 on short-haul route, making several adjustments depending on the time of the year and market conditions. As a result it is unlikely to use the A330 on Cebu, Davao, Hong Kong, Taipei, Tokyo and Singapore all at once. But the A330 deployment plans for the remainder of 2015 show a general increase in the number of short-haul flights even with Cebu Pacific launching a fifth long-haul route, Manila-Doha, in Jun-2015. Cebu Pacific should be able to achieve this as it is currently only using its A330 fleet an average of 11hrs per aircraft per day. This will increase slightly, to about 11.5hrs, in early Jun-2015, when Cebu launches two weekly flights to Doha but reduces Sydney to four weekly flights. Higher utilisation rates will reduce unit costs and also enable Cebu Pacific to meet its capacity targets for 2015 without significant fleet expansion. Cebu Pacific is projecting a 15% increase in seat capacity for 2015 and a 30% jump in ASKs. The ASK increase is driven partially by the full-year effect from Kuwait, Riyadh and Sydney – which were all launched in the latter half of 2014. 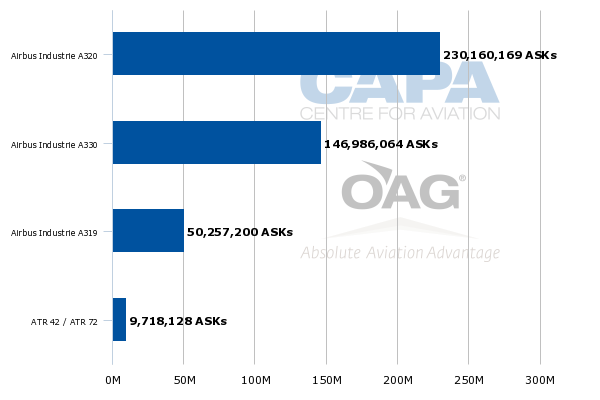 Even with the relatively low utilisation levels the A330 fleet currently accounts for about one-third of total Cebu Pacific ASKs (but only about 10% of total seats). The Cebu Pacific Group (includes subsidiary Tigerair Philippines) is expanding its A320 family fleet in 2015 by only two aircraft from 32 to 34. Two A319s are exiting in 2015 as part of a recent sale of six aircraft to Allegiant Air while four new A320s are being delivered. Cebu Pacific also only added two A320 family aircraft in 2H2014. But Cebu Pacific has been able to free up A320s by using its new A330 fleet to take over short-haul flights previously operated by A320s. As Cebu Pacific expands its long-haul operation, particularly if Melbourne and Sharjah are launched, it will need to relook at expanding its A330 fleet or pulling A330s off short-haul routes. Pursuing the latter is unlikely as the A330s have been profitable on short-haul routes and Cebu Pacific needs this capacity given the relatively limited expansion of its narrowbody fleet. Cebu Pacific’s original business plan for the long-haul unit envisioned a total of eight A330s. But Cebu Pacific never committed to the seventh or eighth aircraft, which Cebu Pacific was initially looking to lease from 2015. Instead Cebu Pacific recently decided to stop – at least for now – at six aircraft. Taking a break from widebody fleet expansion is a sensible approach. Cebu’s long-haul operation has so far been unprofitable, as highlighted in the first part in this series of reports, and there are opportunities to squeeze out more capacity by improving utilisation of the existing six aircraft. With the current A330 fleet it is hard to imagine the airline operating more than six long-haul routes, which Cebu Pacific will be operating once it launches Honolulu. If Sharjah, Melbourne and other potential new route opportunities become available Cebu Pacific will need to revisit acquiring the two additional widebody aircraft in the original business plan. For now Cebu Pacific is wisely taking a wait-and-see approach while in the meantime seeking additional traffic rights and working to improve its performance in the Australia and Middle East markets. Now is not the time to rush into acquiring additional widebody aircraft. Meanwhile, the outcome of the late Apr-2015 bilateral talks with Australia will be an important factor in that planning.